The answer is, both. LinkedIn is more than just a place where you find opportunities; it’s a place where opportunities find you. For that to happen you have to put yourself out there (completing your LinkedIn Profile, sharing content, engaging with your network, etc. ), and make sure you’re putting your best foot forward. Including endorsements and recommendations in your Profile is a great way to complement and confirm the skills and experiences you’ve listed while also catching the eye of potentially interested professional parties. Earlier this year, we made endorsements easier to manage by allowing you to highlight the skills and strengths you’re proudest of, and now, we’ve done the same for recommendations. Beginning today we’ll begin rolling out a refreshed recommendations management page designed to make it easier to manage your recommendations and recommendations requests. You can also now reorder your recommendations – moving your best recommendations to the top of the stack for each experience. 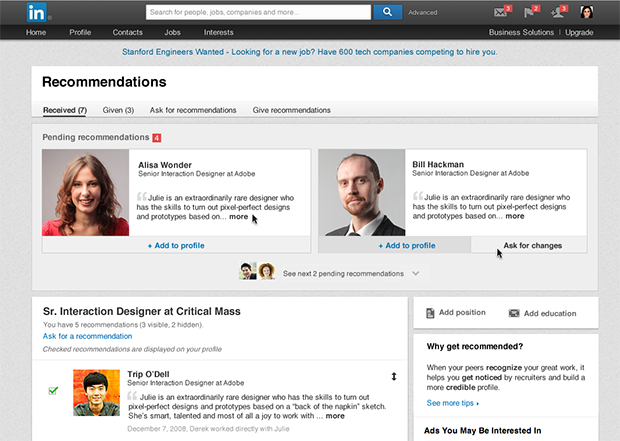 So what are the real differences between recommendations and endorsements? Imagine for a moment that you and a colleague are deciding which employee will be be best to tackle a new project that requires strong project management skills. Your colleague mentions they’re considering Tom so you jump in: “Tom would be perfect, I’ve been impressed with the strategic thinking and change management skills he exhibits.” Your vote of confidence likely just provided the confirmation they were looking for. A LinkedIn endorsement is similar-- you are confirming your colleague’s talents when it come to a specific skill or trait. These votes of confidence add up and send a strong signal about your abilities to accomplish specific tasks. You can vouch for a skill listed on a connection’s profile with a simple click of a button, or, if you feel they are missing a skill, suggest they add a new one (rest assured, you have a choice of whether or not to add that new skill to your profile if someone suggests one). The right endorsements can go a long way in helping you establish your professional brand -- and not all endorsements are created equal. For example, a Project Management endorsement from an existing colleague is more valuable to a recruiter than a similar endorsement from a high-school friend might be. It is therefore in your best interest to add the most appropriate skills to your profile and select the most relevant and credible endorsements to show. It is also advisable to keep this in mind when endorsing your connections. Ask yourself, what will really help them the most? Writing a recommendation lets you drill down into the how and why of your experience working with someone. The golden rule of powerful recommendations is “Show, don’t tell”. Wouldn’t it be more telling to read how Allison built and motivated her team to achieve stellar results instead of reading that “Allison is a great manager”? Always remember that the most compelling recommendations tell a story rather than provide empty statements. A well-done recommendation should describe and give specific examples, whether they reflect someone’s ability to excel under pressure, act as a compassionate leader, succeed as a collaborative team-member or business partner. For recruiters, future hires or potential business partners, such a recommendation provides an important sign that this connection could be the person they are looking for. If you’re the one looking to receive recommendations, always begin by identifying the people who know you well and who can best speak to your aptitude for excelling in a particular professional domain, attest to your leadership or management skills or shed light on some of your best accomplishments. Together, endorsements and recommendations give a better idea of what you’re like to work with, where your true skills and passions are and what some of your strongest soft skills just might be. They also make it easier for opportunities to find you. When all else is equal, they could be the difference between a recruiter reaching out to you over another candidate, a potential employee taking the job on your team versus someone else’s, a potential partner looking for an expert opinion sending you an InMail or not, and on and on. Don’t be shy to reach out and ask for a recommendation. Take a few moments today to acknowledge the skills and accomplishments of your peers past and present with either an endorsement or recommendation, and maybe they’ll do the same!